(1) roasted (salt + citric acid) 100% open inshell (2) raw 100% open inshell (3) raw closed shell (4) raw kernels Packaging: (1) Special PE - PolyEthylene pouches of 1kg, 2kg, 3kg … till 12kg net weight. Also in transparent cellophane (PP-PE) packets of 30g, 100g, 200g and 430g net weight (The appropriate information on them are in Greek and English language, on 30gr in Greek only plus the word "pistachio"). (2) Special PP - Polypropylene sacks of 40kg - 50kg net weight. (3) Special PP - Polypropylene sacks of 40kg - 50kg net weight. (4) Special PE - PolyEthylene pouches of 1kg, 2kg, 3kg … till 12kg net weight. We can handle other packages and in any language upon agreement. Pistachios are free of / shot of external (shell) defects, internal (kernel) defects, blanks, loose kernels or foreign materials. Storage conditions / To be consumed best before end: i) for roasted: Keep in a cool and dry place. 1 year since the packing date. ii) for raw: They are kept fresh and safe against insect affects, mould, rancidity, decay, inside a refrigerating storeroom under specific pistachio cooling conditions. Pistacia vera trees bear the most delicious pistachio nuts in comparison with the usual Pistacia atlantica, Pistacia Kerman, Pistacia terebinthus and all the other pistachio trees varieties. Greek Pistacia Vera excels Iranian, Turkish, Californian or Syrian pistachios in taste and flavour. It is not an egoistic point of view but it is the common truth at the high-class pistachio markets. We do not have available hundreds of tons in a simple warehouse waiting to sell them to anybody, but we serve our customers with the quality we have come in deal some months ago. Raw pistachios are kept fresh and safe against insect affects, mould, rancidity, decay, inside a refrigerating storeroom under specific pistachio cooling conditions which satisfy the highest international food safety standards and turn away the danger of aflatoxins. Consumption patterns depend on factors such as dietary habits, income level and tradition. 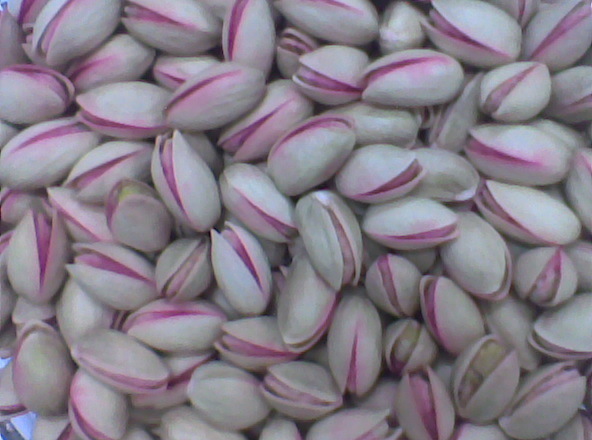 Pistachios are utilized in a variety of ways: - for direct consumption as a healthy snack (raw or roasted) - for processing into added value foodstuffs (e.g. added in mortadella due to the excellent antimicrobial action of the pistachio fatty acids) - as food ingredients (pistachio butter, diced or sliced, paste, pesto, pistachio oil) - for processing in the confectionery (such as baklava, pasteli, coated kernels, luscious garnishes and many other pastries), ice cream and chocolate industries. Last years, pistachios also are used by cosmetic companies in production of high class cream and bath products. Απίστευτη τιμή για ΦΥΣΤΙΚΙΑ ΑΙΓΙΝΗΣ/ PISTACHIO σε Άργος (Ελλάδα) από την εταιρία ZanGostar Ltd..